Receive a Free Bonus Monster Cable Ultra High Speed HDMI Cable with every Marantz BluRay Player (upto value $200). If you are a true connoisseur of premium audio and video reproduction, then the Blu-Ray technology is definitely for you, and if saving money on the highest quality home theater equipment is a priority, then joining Capital Sound's VIP Club is an absolute necessity. Joining the VIP Club is easy, and most importantly, free. It gives you access to incredibly low discount pricing on all of the products we offer, so you never have to compromise on quality to stay within your budget. 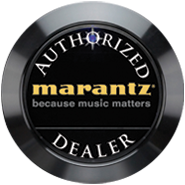 Our line of Marantz Blu-Ray players below is ideal for anyone who appreciates pristine audio quality in their music or movies. The Marantz UD5007 and UD 7007 are 3D ready and a perfect fit for two-channel music systems or multichannel home theaters. Marantz quality and Capital Sound value, it's a match made in audio/video Heaven!